The first thing that comes to mind is that you are going to Paris where you hope to buy jewelry in Hermes. Hermes orange always gets me excited about a project! Ooh, can't wait to find out whats up your sleeve! I love the Hermes box, I want one! Can I get another hint? I'm intrigued!!!! 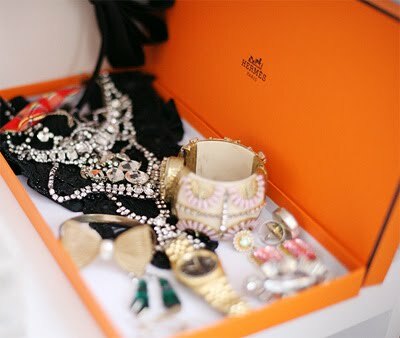 orange hermes boxes get me every time! the Hermes Orange is just unbeatable!